According to local accounts, the Italian Balletto discovered the Machame Route with the help of his dog. When trying to surpass complicated obstacles through the rain forest Balletto is said to have thrown a piece of meat for his dog who found the most efficient route to it. Balletto then forged his route by watching where his dog walked. Probably just a myth, but a nice story anyway. We do know that the Park named a large glacier just to the east of the Diamond Glacier after Balletto as a gesture of thanks for making this very successful route. And it is a very successful route. The Machame Route begins in the south west of the mountain and proceeds steeply north over two days until attaining the edge of the Shira Plateau at 3900m. From here it drops 50 metres to Shira Camp where it joins the Lemosho and Shira Routes onwards to the summit. From Shira Camp the view west over the jagged peaks forming the southern edge of the Shira Plateau is phenomenal at sunset. We usually take acclimatisation excursions from here a couple of hundred metres upwards to ensure a better night’s sleep and improved acclimatisation. 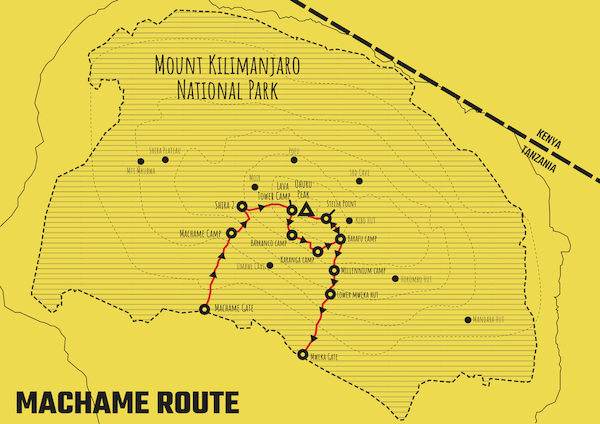 Access to the Machame Route is relatively straightforward and this is reflected in its costing slightly less to climb than all the other routes. There are imminent plans to tar the road all the way to the gate. We expect this to happen within the next year, if the government is able to meet its funding targets. The Machame Route tends to be our most popular choice because the topography of the route is very conducive to good acclimatisation and the likelihood of summitting on this route is relatively high. Machame is said to have two significant drawbacks. Firstly there is the issue of the two obstacles on the route. Guidebooks make a point of telling readers how difficult the scrambling is on two particular features: just before reaching the Shira Plateau, and just after beginning the ascent of the steep Breach Wall after Barranco. These are not as frightening or difficult as is often claimed however. These two features are pictured at right and above at right. The picture at right looks precarious but there is just one stride that must be taken around this outcropping rock and if the climber is nervous of this move we send a member of staff to stand on the ledge underneath this rock and guide the climber’s feet if necessary. Thousands of people pass this way every year and we have never heard of any accidents here. The second issue is the high numbers. It is true that in the peak of the northern hemisphere summer the Machame Route has many climbers on it. Team Kilimanjaro however has a means of minimizing the impact of this by leaving camp each morning much earlier than other groups, thereby also ensuring better weather. During bad weather the clouds typically roll in around lunch time. Though that said, it is actually possible to enjoy rain all day long! The principal advantage of the Machame Route over the standard Rongai, Umbwe and Marangu Routes is that day 3 ascends from 3847m to only 3984m, yet via 4642m at the base of a volcanic rocky outcrop known as the Lava Tower. 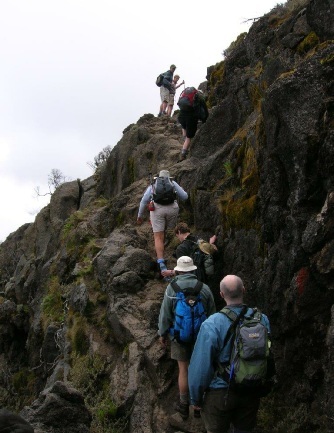 The 600m height differential ensures that Machame exploits the ‘climb high, sleep low’ principle to maximum effect. 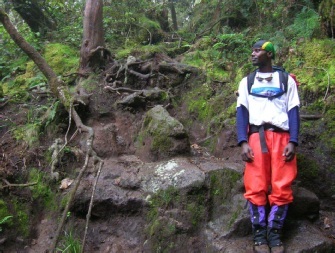 This and the fact that the summit assault on the Machame Route is via a ridge rather than a loose scree slope and is therefore considerably less difficult than the assault on Marangu and the standard Rongai Route, is responsible for the fact that Machame boasts the best summit success rates of all the routes after the TK Rongai Route. Most climbers opt for the 7 day route in order to err on the side of caution with respect to being well rested and adequately acclimatised prior to their assault, however timings on the 6 day route are still safe and most people with active lifestyles and who are younger than around 45 years of age, and not carrying significant excess body mass, will usually manage very well on the 6 day Machame Route. Want to See Photos of our Trekkers on the Machame Route? We keep an archive of all our climbs. See our Machame Route images.